Learn how to make Kala Chana Sprouts Chaat | Black Chickpeas Chaat Recipe with a quick video tutorial. 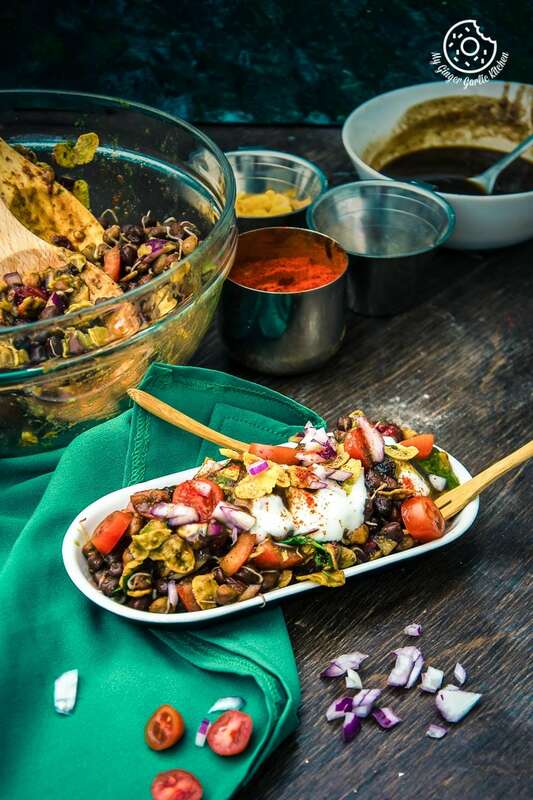 This Kala Chana Chaat is overflowing with the combo of deliciousness and good health. This perfectly healthy, delicious and nutritious chaat would surely make your day. This recipe would come as a savior for the kids who don’t eat sprouts alone. This energy boosting chaat is an interesting way to include some good and nutritious food to kids diet. If the sprouts are steamed and chutneys are made beforehand, then it will only take a few minutes. 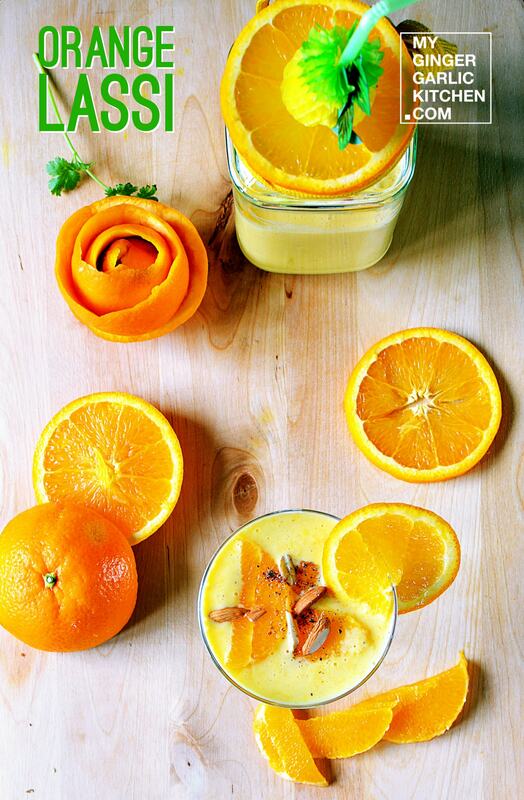 Seriously, this quick, easy snack can be tossed within 2 mins. I am bringing you all the sunshine today with this Spring inspired Indian Style Black Chickpeas (Kala Chana) Sprouts Chaat. Amid these random weather games, I wanted to have some real brightness around me. And the bright shades of this chaat made me think like it’s really spring. This chaat surely made my day shiny and I am sure it would do the same for you. Weather prediction says it’s gonna be like this throughout the coming weekend. So I don’t know if I would be doing something fun during this long weekend due to May Labour Day. Yes, 1st of May is ‘Labor Day’ here and I am especially very excited about this coming 3-day long weekend. 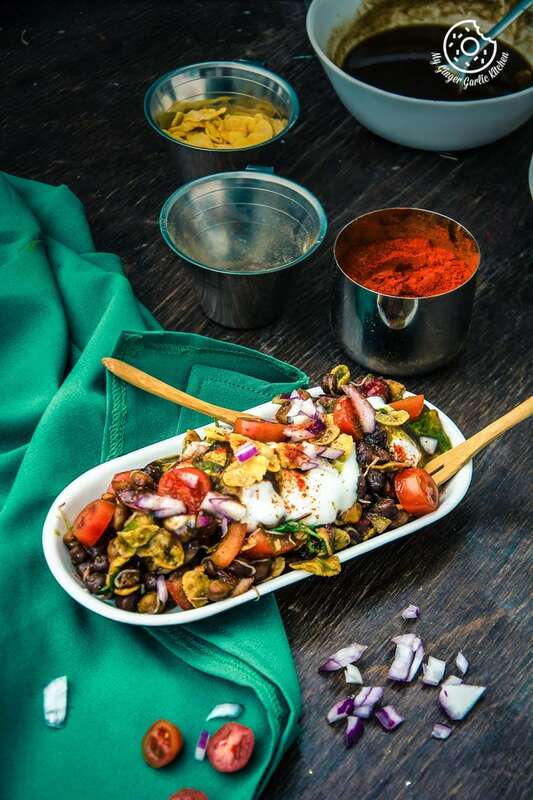 I don’t know about you guys if your weekend would be chilly like mine or not, but this perfectly healthy, delicious and nutritious chaat would surely make your day. 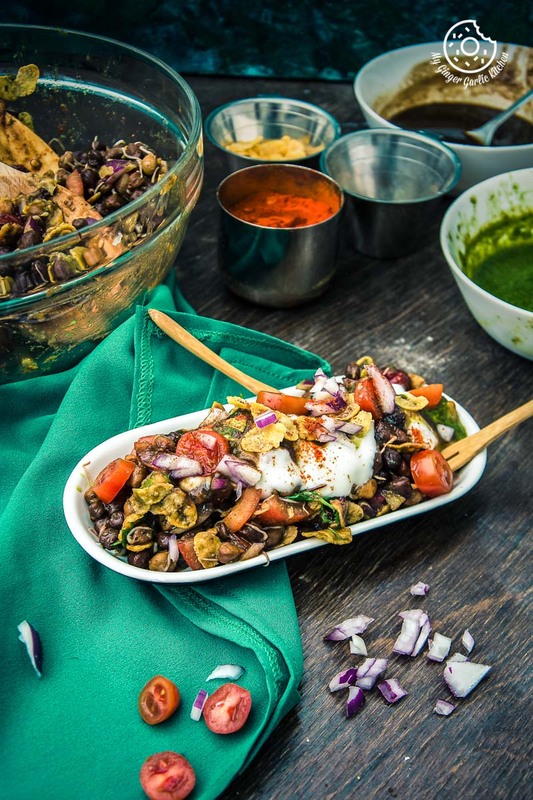 Making this chaat is certainly on my to-do list during this weekend. Okay, now we need to talk about this Chaat. No frying or sautéeing needed for this chana sprouts chaat. So this is a good alternative for calorie conscious people. Black chickpeas aka Kala Chana has sufficient amount of protein and iron. Many people like to eat black chickpeas sprouts as a post-exercise snack. But if you ask me, I like mine along with some veggies, cereals, berries, spices, sweet, spicy and tangy chutneys. So, as a result, I get this healthy and delish sprouts chaat. 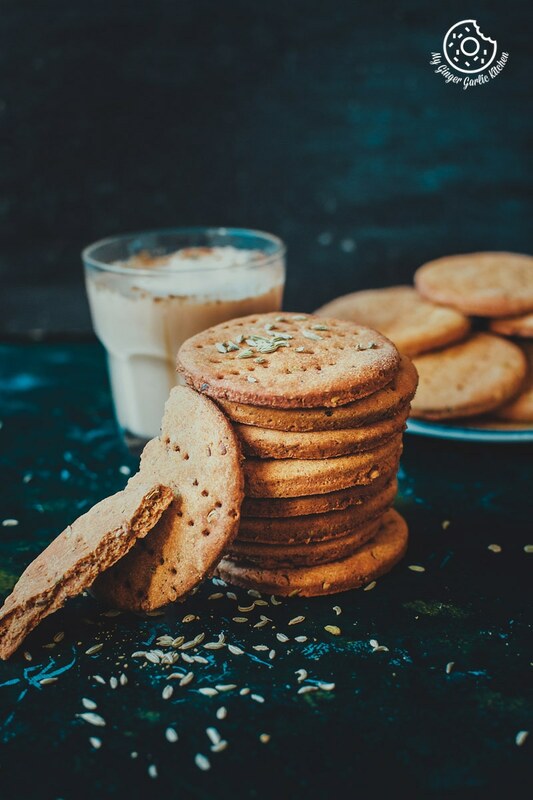 It is super easy to make and it can easily be served as breakfast, brunch or a snack. 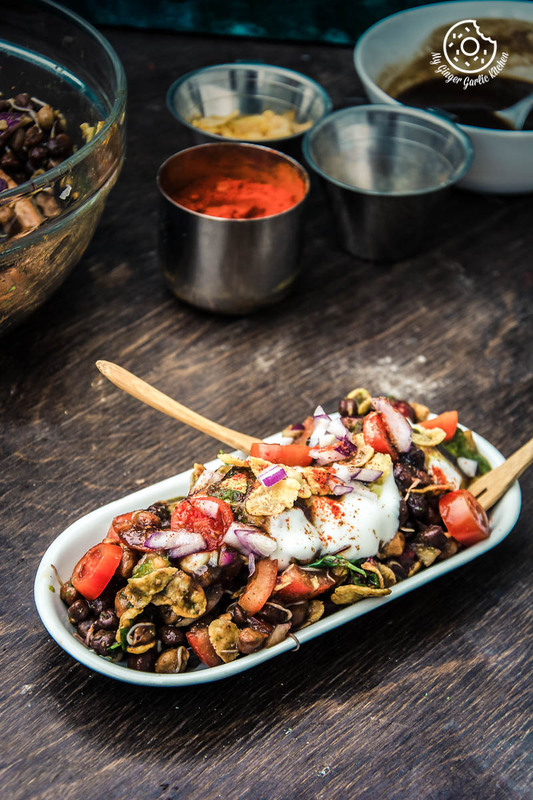 You can also eat this spicy sprouted chana mixture as a crunchy snack, even without the toppings. My folks prefer to eat it as brunch. 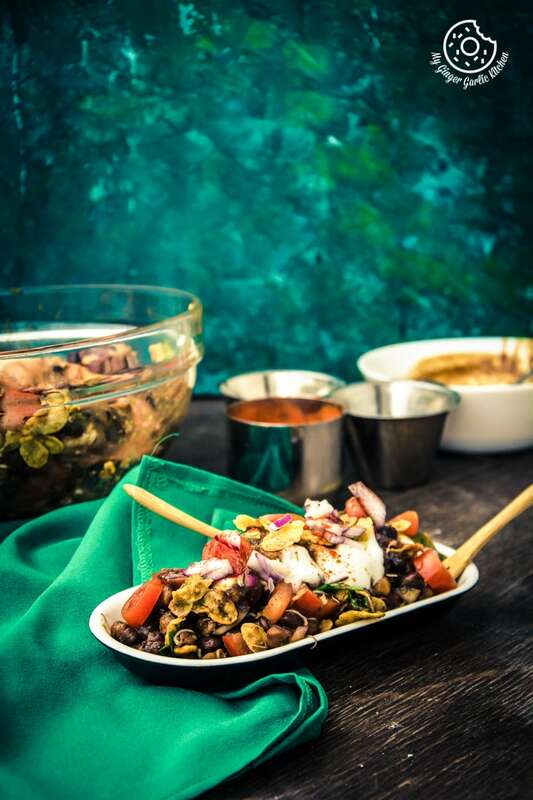 This Kala Chana sprouts chaat is overflowing with the combo of deliciousness and good health. 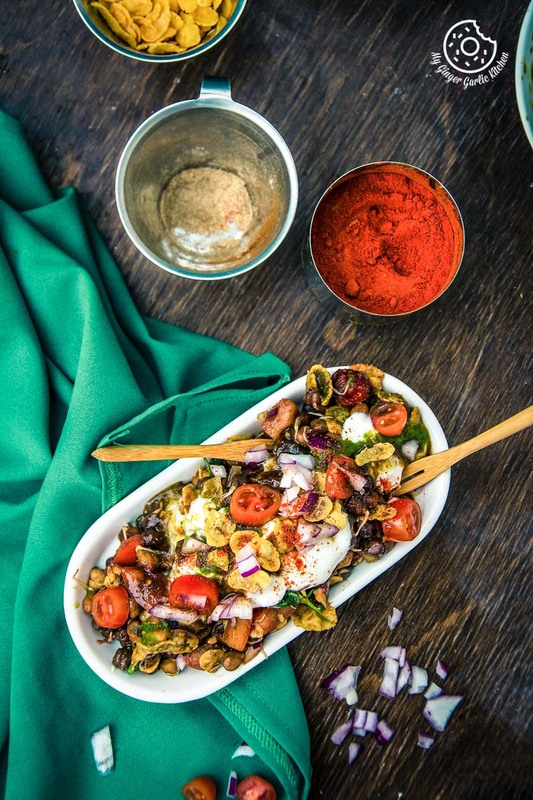 In this Chaat, you will get appetizingly delish steamed sprouts along with some corn flakes, onions, tomatoes, strawberries, chutneys which are topped with chilled yogurt, and some more chutneys with flavorful spices. This recipe would come as a savior for the kids who don’t eat sprouts alone. This energy boosting chaat is an interesting way to include some good and nutritious food to kids diet. If the sprouts are steamed and chutneys are made beforehand, then it will only take a few minutes. 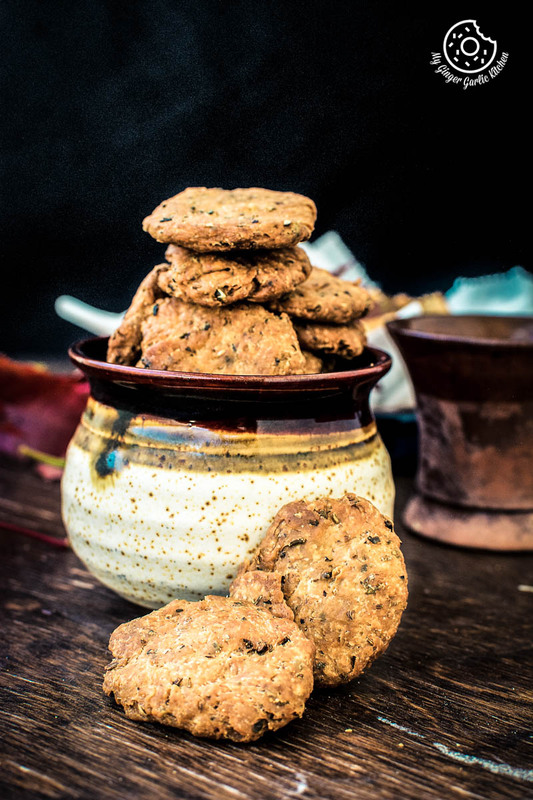 Seriously, this quick, easy snack can be tossed within 2 mins. So let’s learn to make it in the shortest time possible. 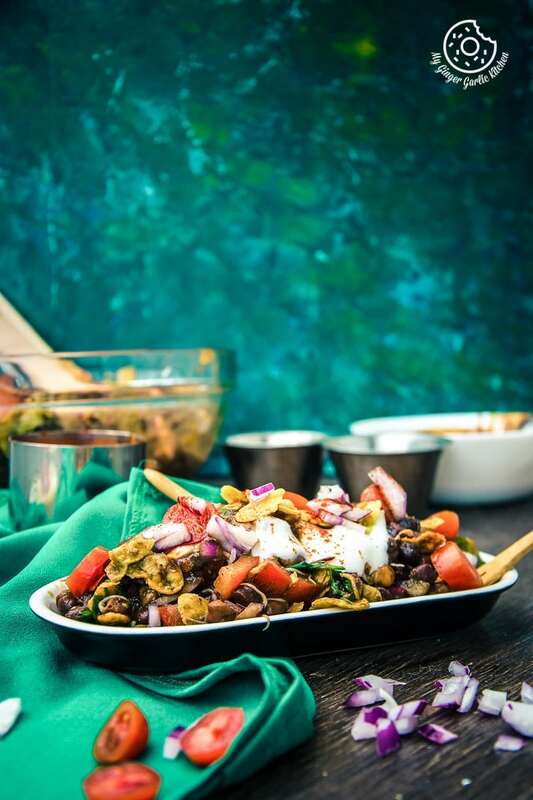 This Kala Chana Sprouts Chaat | Black Chickpeas Chaat Recipe is overflowing with the combo of deliciousness and good health. 1. Steam or boil black chickpeas sprouts till they are almost cooked. 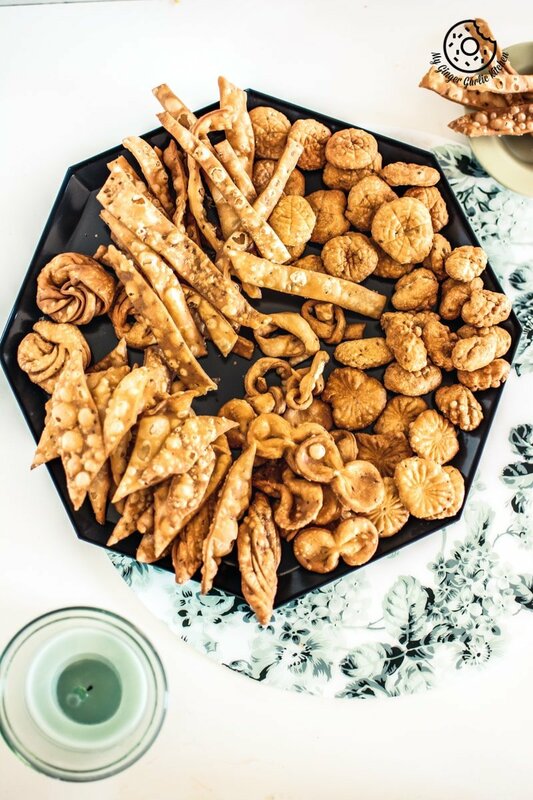 Don’t overcook them — we want their crunchy texture. 2. If steaming, then let the sprouts cool completely. If boiling, then strain the cooked sprouts and let them cool completely. 3. In a large mixing bowl add sprouted chickpeas, tomatoes, onions, strawberries, coriander, corn flakes, chaat masala powder, roasted cumin powder, tamarind chutney, green chutney and toss well to combine. 4. Take out chaat in individual bowls. 6. Top with tamarind chutney, green chutney, some corn flakes, onions, tomatoes. 7. Sprinkle red chili powder, chaat masala powder. 8. Serve Sprouted Kala Chana Chaat immediately.